RecruitMyMom PTY LTD (referred to herein as “RecruitMyMom.co.za,” "We," "Us", “Website” "RMM" or collectively, as "Company" “RMM”). The terms "You" and "User" as used herein refer to all individuals and/or the entities they represent (jointly and severally) accessing this Website for any reason and include, but are not limited to, "Employers" (person or entity that is accessing the Website to post a job or for any reason related to the purpose of seeking candidates also referred to as Client) and "Candidates" (a User who is accessing the Website to search for a job or in any other capacity except as an Employer). These Terms and Conditions are effective as of August 2012. RMM authorizes you to view the material (defined below) on the website and in emails from the website solely for the purpose of locating and recruiting potential candidates (if you are an employer and for the purpose of seeking employment opportunities (if you are a job seeker). The Website is intended for i) individuals seeking employment and for employers seeking candidates for employment ii) networking facilitation for members of the site. You may use this Website only for lawful purposes within the stated context of the Website's intended and acceptable use. RecruitMyMom.co.za is the sole interpreter of the Website's intended and acceptable use. As a job seeker, this authorizes you to view the material on the Website and in emails from the Company solely for your personal, non-commercial use. As Work provider, you agree that you are solely responsible for the content of any document and written communication you post to the Website and any consequences arising from such posting. Your use of the Website is a privilege. RecruitMyMom.co.za reserves the right to suspend or terminate that privilege for any reason at any time, in its sole discretion. RecruitMyMom.co.za reserves the right to accept or reject whomsoever it feels can or cannot be a member of the site. respond to postings by other Users in any manner or for any purpose other than that which is expected. Communications or behaviours soliciting a RecruitMyMom.co.za Client’s business, by our members or competitors are prohibited. directly or indirectly, intentionally disrupt or interfere with the Website or Services in any manner that may materially adversely affect RecruitMyMom.co.za, you or any third party. submit, upload, post, e-mail or otherwise transmit without authorization any material that contains personal or private information concerning any third party person or entity, including without limitation, phone number(s) or addresses, passwords or other similar information. use the Website or Services for any purpose or in any manner that violates any local law or regulation or the law or regulation of any foreign government including but not limited to scripts, bots and other software, to try to collect information from the Website or to break into any of its servers. if at any time during the term of this agreement RMM comes to the understanding that you misled RMM about your qualifications, work experience, business practices and/or services RMM reserves the right to terminate this agreement. Report inappropriate postings or member conduct to us using the “Contact Us” page. RMM is the sole interpreter of these rules. Users who violate these rules may have their access and use of the Website suspended or terminated, at RMM's discretion. RMM reserves the right to change these rules in accordance with the amendment policy in the Terms and Conditions. (a) Your Document may not contain: (i) copyrighted material (unless you own the copyright or have the owner's permission to post the copyrighted material); (ii) trade secrets (unless you own them or have the owner's permission to post them); (iii) material that infringes on or misappropriates any other intellectual property rights, or violates the privacy or publicity rights of others; (iv) keywords or white text keywords (including any words embedded in the Document and hidden from the User); (v) anything that is sexually explicit, obscene, libellous, defamatory, threatening, harassing, abusive, or hateful; or (vi) anything that is embarrassing or offensive to another person or entity. (b) You may not use your Document(s) to: (i) impersonate another person, living or dead; (ii) post false, inaccurate or misleading information; (iii) post advertisements or solicitations of business (including, but not limited to, E-mail Processors, franchises, "club memberships," distributorships, or anything requiring a monetary investment by the User, including a request for payment to obtain job listings); (iv) post chain letters or pyramid schemes; or (v) post opinions or notices, commercial or otherwise. (c) Your document(s) must contain sufficient detail to convey clearly to the user the nature and requirements of the job opportunity. Documents from any third party charging a fee are prohibited. (d) Job postings must be individual openings for traditional job seekers. You may not use this website to collect personal information or candidates details for competitive purposes. (e) RecruitMyMom.co.za is under no obligation to monitor the documents posted on the website, but it does monitor documents regularly. Documents found to violate the Posting Rules will be removed at RecruitMyMom.co.za's discretion. attempting to interfere with service to any User, host or network, including, without limitation, via means of submitting a virus to the Website, overloading, "flooding", "mail bombing" or "crashing"
Collection of candidate information and CV’s for competitive commercial gain. Collection of Clients for competitive commercial gain. Any reference to “information” will mean “personal information” as defined in the Protection of Personal Information Act (Act No. 4 of 2013), regardless of form, insofar as such information relates to you, your business or affairs, employees, directors, clients, suppliers and / or third parties. RMM will require information from you from time to time to provide you with the services you require and you undertake, subject to 1.4, to provide or arrange access to such information for RMM as and when RMM determines necessary. This information will only be used by RMM for invoicing and other administrative purposes (where such information relates to your contact details and invoicing information); for the purposes of identifying consultants for possible selection by you and enabling consultants selected by you to provide the services you require; and / or for the purposes of conducting its business and commercial activities. Unless otherwise agreed between you and RMM and subject to these terms, RMM will treat information provided by you in terms of this clause 1 as confidential. You warrant that you will at all times have the necessary authority, permissions and / or licences to provide information in terms of 1.2, including but not limited to authority, permissions and / or licences to provide information relating to third parties. RMM will use the information provided by you in terms of 1.2 for the purposes set out therein and retain such information in whatever form until such time that you request in writing the destruction or deletion thereof. RMM will use your contact details to provide you with quarterly newsletters outlining the services it and its consultants provide and any developments that may be of interest, until such time as you advise it otherwise in writing or unsubscribe from its mailing list. All title, copyright and any other intellectual property in any documents of whatsoever nature generated or amended by RMM as a result of the provision by it of the services will only pass to you upon receipt by the consultants and / or RMM (as the case may be) of payment of all fees and disbursements which may be owed or owing, in full, without set-off or derogation, in accordance with these Terms of Service. transferred to or between various countries internationally as a consequence of RMM using information technology hosted or operated by a third party in or from such countries to store and/or process any information in its possession or under its control, which countries may not have data protection laws that are equivalent to those in force in the jurisdiction in which you reside. RMM will, as far as reasonably practicable in the circumstances, use information technology hosted or operated by a third party in or from countries whose data protection laws are equivalent to those in force in the jurisdiction in which you reside. This clause 1 will survive the termination or cancellation of these Terms of Service for any reason whatsoever. Employers simply pay upon successful placement, that's it! Choose from over 150 different skills. Fee charged for the duration of the contract. Rate is skill dependent (15%-20%) and will be discussed per client upon receipt of a job spec. The charge out rate is based on the level of experience, length and skill required for the role. The rate is market and industry related. The rate is discussed per client upon receipt of a job spec. ‘AGREEMENT’ shall mean the provisions contained herein together with any appendices. ‘APPLICABLE LAW’ shall mean the laws of South Africa. ‘CANDIDATE’ refers to any person selected and introduced to The Client by RecruitMyMom (PTY) LTD. Also referred to as RecruitMyMom-candidate or RMM Consultant for the purposes of this contract. ‘CLIENT’ refers to the person, job-provider or company to whom RecruitMyMom provides recruitment of permanent, temporary, contract or freelance staff. Also herein referred to as RMM-Client or job-provider. ‘COMPANY’ refers to RecruitMyMom (PTY) LTD, a recruitment agency performing placement services, also herein referred to as RecruitMyMom.co.za or RMM. ‘CONFIDENTIAL INFORMATION’ shall mean any information that may be a trade secret as well as communications of a confidential nature relating to the business of the Client and its associates. ‘EFFECTIVE DATE’ shall mean the date of this Agreement or the date on which the Candidate began to perform any of the Services to the Client, whichever comes first. ‘PARTY’ shall mean either the Client or the Company or the Candidate, as the case may be. ‘PARTIES’ shall mean both the Client and the Company or the Company and the Candidate, as the case may be. ‘PERSONNEL’ shall mean persons employed by the Client or the Company. ‘SERVICES’ shall mean those services requested by the Client and agreed to by the RMM-Candidate or RMM-Consultant. 2.1 This agreement constitutes the sole memorandum of agreement between the parties relating to the subject matter hereof and no variation or addition hereto or consensual cancellation hereof shall be of any force or effect unless reduced to writing and signed by the parties. 2.2 No indulgence granted by either party in regard to the enforcement of its rights under this agreement shall be construed as a waiver of such rights (unless expressed as such in a written document signed by the indulgent party) nor shall it serve to stop the indulgent party from strictly enforcing its rights in the event of a subsequent breach thereof. 2.3 This Agreement contains all the express provisions agreed on by the Parties with regard to the Services and the Parties waive the right to rely on any alleged express provision not contained in this Agreement. 2.4 Neither Party may cede that Party’s rights or delegate that Party’s obligations under this Agreement without the prior written consent of the other Party. 2.5 Invalid Provisions:- If any provision contained in this Agreement is rendered void, illegal or unenforceable in any respect, the validity, legality and enforceability of the remaining provisions shall not in any way be affected or impaired. 3.1 RecruitMyMom is a web-based recruitment agency that specialises in matching skilled candidates to companies that offer meaningful standard and non-standard employment, being full-time permanent or part-time permanent jobs, fixed-duration jobs and consulting work. 3.3 Nothing in this Agreement shall be construed as constituting employment service or temporary employment service as contemplated in section 198 of the Labour Relations Act, 55 of 1995, or any other applicable statute or law. The Parties hereby expressly acknowledge and agree that notwithstanding any interpretation of this Agreement, directly or indirectly or in any manner whatsoever, it is not the intent of the Parties to enter into any agreement that may create an employer-employee relationship, whether temporary or otherwise, or any other relationship that may fall within the ambit of the Labour Relations Act, the Basic Conditions of Employment Act or any other act or regulation that is applicable to issues of employment. 4.1 This agreement shall be deemed to have commenced on the date of signing, or, upon engagement of the introduced RMM Candidate by the Client, whichever is earliest. 5.1 RecruitMyMom has a membership network of thousands of skilled, experienced candidates throughout South Africa. 5.2 In the case where any RMM-Candidate is introduced to the Client through the RMM network, and the Client hires the RMM-Candidate in any capacity, within 1 (one) year of referral, the Client will be liable to pay RMM a recruitment fee. 5.3 The Client will be invoiced by RMM, according to either the service level agreed upon when posting the job (Basic, Premium, Fixed Duration or Consultant) or according to the RMM fee structure of the actual position offered to the Candidate by the Client, should the engagement of the RMM-Candidate differ from the initial service level posting on the RMM Network. 5.4 The Client acknowledges and undertakes to contact RMM immediately should the Candidate approach the Client in order to secure placement directly. 5.5 The Client agrees that it shall at no time approach any of RMM Candidates or staff directly, with a view to employing them, or with a view to gain any information about RMM finances, methods of payment, working practices or any company information whatsoever. 5.6 Should the Client fail to inform RMM of the appointment of a RMM-Candidate prior to the actual engagement of the RMM-Candidate, the Client will automatically be invoiced for a Permanent service placement fee (ten percent of the annual cost to the company for permanent placements) and subject to clause 5.3 supra. 5.7 RecruitMyMom (PTY) LTD personnel are not for hire by our clients. Should they leave the employ of RMM and be employed by a client within 1 (one) year, a full Permanent Service Placement fee (ten percent of the annual cost to the company for permanent placements) will be applicable. 6.1 In the case where any RMM-Candidate is introduced to the Client through the RMM network, and the Client hires the RMM-Candidate in any capacity, within 1 (one) year of referral, placement will have taken place and the Client hereby agrees that he/she is liable to pay RMM the relevant recruitment fee based on the actual placement. 6.2 A Permanent placement fee is calculated as a percentage of the candidates cost to company for a year. 6.3 The Permanent Service Level Fee is 10% of the RMM-Candidates annual cost to the company. 6.4 RMM is a VAT registered company and our fees agreed exclude VAT. Our VAT registration number is 4860271271. 6.5 Payment is due on or before the due date of the invoice received. A copy of a signed letter of appointment or employment contract is required as part of the warranty. 6.6 Payment: Amounts due to RMM shall be paid in full on the date of receipt of invoice. Internet transfers would be preferred. Cash payments into the account number given requires a 3 % handling fee, cheque payments require an additional ZAR50.00 handling fee as the bank charges a fee for such deposits. 6.7 A fee of R100 will be added to your account for collection expenses and any accounts which are outstanding for longer than 30 days will be handed over for collection. Interest at 2.5% per month will be added on outstanding accounts of longer than 30 days. To avoid these extra charges, prompt payment is necessary. 7.2 Should the permanent placement of the RMM-Candidate not be successful and the services of the Candidate is terminated lawfully by the Client or Candidate within 3 (three) months of appointment of start date, as per the provisions of the LRA, RMM will attempt to replace the candidate with another candidate and no additional placement fee will be charged for the 2nd placement. (d) the role was not made redundant. 8.1 All information regarding each and every RMM-Candidate is and shall remain confidential, and shall not be passed on to any third party, except with the written approval of RMM. In the event of the Client becoming aware that any associated company or third party might be interested in the RMM-Candidate, the Client undertakes to furnish the name and contact details of such a third party to RMM, who shall be entitled to contact the associated company directly and invoice accordingly. 8.2 For the protection of the Client, RMM and the Candidates alike, RMM undertakes not to divulge any information concerning candidates or clients to any outside/third party. 9.1 In order to safeguard the confidentiality of candidates, extensive enquiries are not, as a general rule, made to the present or previous employers of candidates at interview stage, unless candidates have specifically authorized RMM to do so. It is customary for reference checking to be undertaken only at the stage when, subject to satisfactory reference checking, the Candidate will receive an offer of employment. 9.2 Reference checking, if authorized by the RMM-Candidate, will only be done on the written request of the client and may include a credit bureau check, a criminal conviction check and any other reasonable relevant reference check as may be required by the client. These will be charged separately. 10.1 As the RMM-Candidate will be appointed on permanent basis as an employee of The Client, the working hours are generally expected to be as agreed between the parties. 10.2 As remuneration is based on the agreed working hours, and the placement fee is based on the remuneration of the RMM-Candidate, the working hours are central to this agreement and will be agreed upon between the parties. 10.3 The Client agrees and acknowledges that all working hours will be subject to and in accordance with the provisions of The Basic Conditions of Employment Act, 75 of 1997. 10.4 Part-Time or Flexible working hours are regarded as any hours fewer than 45 hours per week but more than 24 hours per month, and are generally agreed between the parties. 11.1 RMM shall not be held responsible for any damages or losses of whatsoever nature that may be suffered or incurred by the client arising from RMM providing incorrect or inaccurate information regarding a Candidate, non-disclosure by RMM to the Client relating to any Candidate, the error or inaccuracy in or omission from any reference check obtained by RMM or which ought to have been obtained by RMM, recommendations made in good faith by RMM’s employees, or arising from the conduct of any candidate after the appointment or the dismissal of any candidate after the appointment. 12.1.2 If the Client fails to pay any money due to RMM within 10 days after receiving written notice from RMM that such payment is overdue. 12.2.2 If the Client is in material breach of its obligations pursuant to this Agreement and has not remedied the same within 10 days (or such longer period as the Contractor may have subsequently approved in writing) following the receipt by the Client of the COMPANY notice specifying such breach. 13.2 In the event of any dispute failing to be resolved through negotiation as per clause 13.1 above, the said dispute or difference shall be submitted to arbitration in accordance with the provisions set out below. 13.3 Such arbitration shall be held at Cape Town and in a summary manner on the basis that it shall not be necessary to observe or carry out the strict rules of evidence or the strict formalities or procedures prescribed under the arbitration laws so that there shall be no written pleadings or evidence or formal discovery of documents, except insofar as required by the arbitrator but otherwise the arbitration shall be conducted according to the procedures prescribed by the arbitration laws of the Republic of South Africa. 13.4 Such arbitration shall be held as soon as practicably possible and with a view to it being completed within 21 (twenty-one) business days after it is demanded, having regard to any urgency with respect to the matter in issue. 13.5. The arbitrator shall decide the matter submitted to him according to what he considers just and equitable in the circumstances and shall have regard to the desire of the parties to dispose of such dispute expeditiously, economically and confidentially. 13.6 The decision of the arbitrator pursuant to the foregoing provisions shall be final and binding. 13.7 The foregoing arbitration provisions shall continue to be binding on the parties notwithstanding any termination or cancellation of this agreement. 13.8 Notwithstanding anything to the contrary herein contained, either party shall be entitled to apply for urgent relief in any civil court in respect of any matter arising out of this agreement. 14.1 Regardless of the place of execution, performance or domicile of the parties, this Agreement shall be governed according to the laws of the Republic of South Africa, and the Parties submit to the authority of any South African court having the requisite jurisdiction over them. 15.1 This Agreement constitutes the entire agreement between the Parties regarding the matters set out herein or related thereto and no representations or warranties not set out in writing in this Agreement shall be binding upon the Parties. No variation, abandonment or waiver of rights or obligations under this Agreement or consensual cancellation of the Agreement, shall be binding unless it is in writing and signed by the Parties. 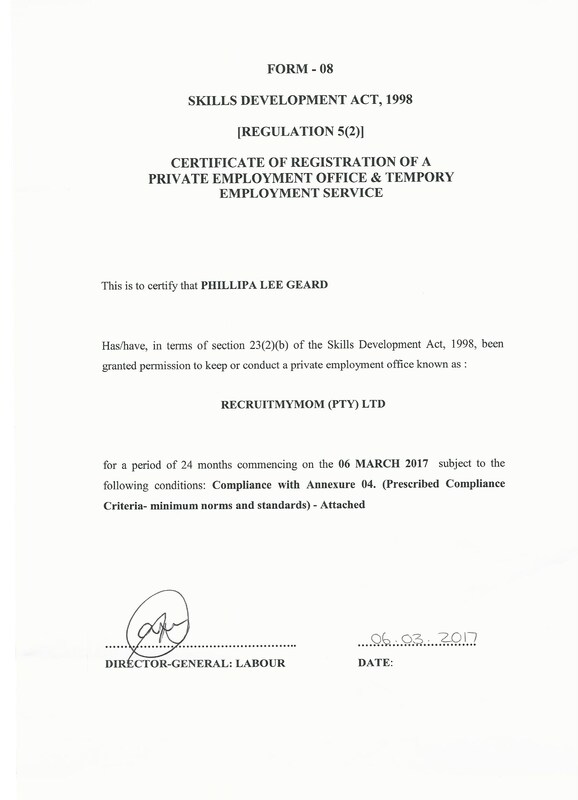 ‘LIMITED or FIXED TERM EMPLOYMENT’ refers to non-standard employment, where the term/duration of employment terminates on the occurrence of a specific event or the completion of a specified task or project or on a fixed date other than the employee’s normal or agreed retirement age. ‘PLACEMENTS’ shall mean acceptance of a RMM-Candidate to perform services to a Client on Limited or Fixed duration Agreement. This agreement constitutes the sole memorandum of agreement between the parties relating to the subject matter hereof and no variation or addition hereto or consensual cancellation hereof shall be of any force or effect unless reduced to writing and signed by the parties. No indulgence granted by either party in regard to the enforcement of its rights under this agreement shall be construed as a waiver of such rights (unless expressed as such in a written document signed by the indulgent party) nor shall it serve to stop the indulgent party from strictly enforcing its rights in the event of a subsequent breach thereof. This Agreement contains all the express provisions agreed on by the Parties with regard to the Services and the Parties waive the right to rely on any alleged express provision not contained in this Agreement. Neither Party may cede that Party’s rights or delegate that Party’s obligations under this Agreement without the prior written consent of the other Party. Invalid Provisions:- If any provision contained in this Agreement is rendered void, illegal or unenforceable in any respect, the validity, legality and enforceability of the remaining provisions shall not in any way be affected or impaired. RecruitMyMom is a web-based recruitment agency that specialises in matching skilled candidates to companies that offer meaningful standard and non-standard employment, being full-time permanent or part-time permanent jobs, fixed-duration jobs and consulting work. The purpose of this document is to provide for the terms and conditions in terms of which RMM-Candidates are matched with the Client and in terms of which RMM undertakes to avail the Candidate to the Client for a fixed or limited duration or for a specific project. Nothing in this Agreement shall be construed as constituting employment service or temporary employment service as contemplated in section 198 of the Labour Relations Act, 55 of 1995, or any other applicable statute or law. The Parties hereby expressly acknowledge and agree that notwithstanding any interpretation of this Agreement, directly or indirectly or in any manner whatsoever, it is not the intent of the Parties to enter into any agreement that may create an employer-employee relationship, whether temporary or otherwise, or any other relationship that may fall within the ambit of the Labour Relations Act, the Basic Conditions of Employment Act or any other act or regulation that is applicable to issues of employment. This agreement shall be deemed to have commenced upon engagement of the introduced RMM Candidate by the Client or on the date of signing, or, whichever is earliest. The agreement will automatically lapse as specified in Schedule 1 (provided at the time of appointment). The Placement Fee is calculated as a percentage of the RMM-Candidates remuneration, for the duration of the contract and any agreement to extend the duration of the contract will automatically result in the extension of this agreement for the same period of extension. Should there be a justifiable reason for the extension of the fixed duration agreement with the RMM-Candidate, a new agreement will be put into place and the fee will be renegotiated. RecruitMyMom has a membership network of thousands of skilled, experienced candidates throughout South Africa. In the case where any RMM-Candidate is introduced to the Client through the RMM network, and the Client hires the RMM-Candidate in any capacity, within 1 (one) year of referral, the Client will be liable to pay RMM a recruitment fee. The Client will be invoiced by RMM, according to either the service level agreed upon when posting the job (Permanent, Fixed Duration or Consultant) or according to the RMM service level Fee (Permanent, Fixed Duration or Consultant) of the actual position offered to the Candidate by the Client, should the engagement of the RMM-Candidate differ from the initial service level posting on the RMM Network. The Client acknowledges and undertakes to contact RMM immediately should the Candidate approach the Client in order to secure placement directly. The Client agrees that it shall at no time approach any of RMM Candidates or staff directly, with a view to employing them, or with a view to gain any information about RMM finances, methods of payment, working practices or any company information whatsoever. Should the Client fail to inform RMM of the appointment of a RMM-Candidate prior to the actual engagement of the RMM-Candidate, the Client will automatically be invoiced for a fixed term contract placement fee subject to clause 5.3. RecruitMyMom (PTY) LTD personnel are not for hire by our clients. Should they leave the employ of RMM and be employed by a client within 1 (one) year, a full Permanent Service Placement fee (ten percent of annual cost to the company for permanent placements) will be applicable. In the case where any RMM-Candidate is introduced to the Client through the RMM network, and the Client hires the RMM-Candidate in any capacity, within 1 (one) year of referral, the Client will be invoiced an upfront placement fee for the duration of the employment contract. A Fixed Term Placement Fee is calculated as a percentage of the RMM-Candidate’s remuneration, for the duration of the contract. Schedule 1 (provided at the time of appointment) shall be signed by the parties to this agreement and shall form part of the agreement. No alterations or additions to the services of the RMM-Candidate as reflected in Schedule 1(provided at the time of appointment) of the agreement, may be made without informing RMM. Neither Party may affect any change of whatever nature to the scope of the Services outlined in the Schedule(s), without the prior written approval of the other Party. Should the scope and parameters of the Services change materially after the signing of this Agreement, the Parties shall draw up and sign a new Agreement which the new Agreement will cancel and revoke the terms and provisions of this Agreement. The Client shall appoint one of its employees as its representative and The RMM Candidate shall report to this representative. The RMM-Candidate shall comply with all the Client’s regulations, practices, and instructions and with all applicable laws and regulations issued by any competent authorities, and the Client shall specifically instruct The RMM Candidate to this effect. In the event of a serious breach of the Client’s security or a violation of the Client’s policies and procedures, the Client’s right of termination as per the provisions of the Labour Relations Act is recognised. The RMM Candidate shall, therefore, ensure that she is aware of the Client’s Rules and Policies and agrees to act according thereto. RMM is a VAT registered company and our fees agreed to exclude VAT. Our VAT registration number is 4860271271. Invoicing is done upfront for the full duration of the contract and payment is due before or on the start date of the RMM candidate. Payment: Amounts due to RMM shall be paid in full on the due date of the invoice. Internet transfers would be preferred. Cash payments into the account number given, requires a 3 % handling fee, cheque payments require an additional ZAR50.00 handling fee as the bank charges a fee for such deposits. A fee of R100 will be added to your account for collection expenses and any accounts which are outstanding for longer than 30 days will be handed over for collection. Interest at 2.5% per month will be added to outstanding accounts of longer than 30 days. To avoid these extra charges, prompt payment is necessary. Should The Client, its subsidiary or associated companies, or any person, organization or company to whom the client subsequently introduces the RMM Candidate, wish to employ the RMM Candidate on a permanent basis, either at the conclusion of the contract or for 6 months from the conclusion of the contract period, the client, its subsidiary or associated companies, or any person, organization or company to whom the client subsequently introduced the employee will be charged a placement fee, for the placement of permanent employees, of ten (10) percent of the first year's remuneration including bonuses, allowances and commissions. The parties agree that this amount is what RMM will lose by way of income and agree that no further proof of loss of income is required in this respect. In the event that RMM needs to recover this amount from the job-provider, the job-provider acknowledges that it would be liable for legal fees on an attorney and own client basis. This paragraph is without prejudice to any and all other legal rights that RMM may have against the client. All information regarding each and every RMM-Candidate is and shall remain confidential, and shall not be passed on to any third party, except with the written approval of RMM. In the event of the Client becoming aware that any associated company or a third party might be interested in the RMM-Candidate, the Client undertakes to furnish the name and contact details of such a third party to RMM, who shall be entitled to contact the associated company directly and invoice accordingly. For the protection of the Client, RMM and the Candidates alike, RMM undertakes not to divulge any information concerning candidates or clients to any outside/third party. In order to safeguard the confidentiality of candidates, extensive enquiries are not, as a general rule, made to the present or previous employers of candidates at interview stage, unless candidates have specifically authorized RMM to do so. It is customary for reference checking to be undertaken only at the stage when subject to satisfactory reference checking, the Candidate will receive an offer of employment. Reference checking, if authorized by the RMM-Candidate, will only be done on the written request of the client and may include a credit bureau check, a criminal conviction check and any other reasonable relevant reference check as may be required by the client. These will be charged separately. As the RMM-Candidate will be appointed as an employee of The Client, the working hours are generally expected to be as agreed between the parties and as contained in Schedule 1 (provided at the time of appointment). The Client agrees and acknowledges that all working hours will be subject to and in accordance with the provisions of The Basic Conditions of Employment Act, 75 of 1997. Part-Time or Flexible working hours are regarded as any hours fewer than 45 hours per week but more than 24 hours per month and are generally agreed between the parties. Travel requirements are generally expected to be as agreed between the parties, however, should the Client require the RMM Candidate to travel to a remote site (i.e. a site other than the normal place of work), this should be contained in Schedule 1 (provided at the time of appointment). The travel costs and reasonable expenses shall be for the Client’s account, inclusive of RMM’s fees. RMM shall not be held responsible for any damages or losses of whatsoever nature that may be suffered or incurred by the client arising from RMM providing incorrect or inaccurate information regarding a Candidate, non-disclosure by RMM to the Client relating to any Candidate, the error or inaccuracy in or omission from any reference check obtained by RMM or which ought to have been obtained by RMM, recommendations made in good faith by RMM’s employees, or arising from the conduct of any candidate after the appointment or the dismissal of any candidate after the appointment. If the Client fails to pay any money due to RMM within 10 days after receiving written notice from RMM that such payment is overdue. If the Client is in material breach of its obligations pursuant to this Agreement and has not remedied the same within 10 days (or such longer period as the Contractor may have subsequently approved in writing) following the receipt by the Client of the COMPANY notice specifying such breach. In the event of any dispute failing to be resolved through negotiation as per clause 13.1 above, the said dispute or difference shall be submitted to arbitration in accordance with the provisions set out below. Such arbitration shall be held at Cape Town and in a summary manner on the basis that it shall not be necessary to observe or carry out the strict rules of evidence or the strict formalities or procedures prescribed under the arbitration laws so that there shall be no written pleadings or evidence or formal discovery of documents, except insofar as required by the arbitrator but otherwise the arbitration shall be conducted according to the procedures prescribed by the arbitration laws of the Republic of South Africa. Such arbitration shall be held as soon as practicably possible and with a view to it being completed within 21 (twenty-one) business days after it is demanded, having regard to any urgency with respect to the matter in issue. The arbitrator shall decide the matter submitted to him according to what he considers just and equitable in the circumstances and shall have regard to the desire of the parties to dispose of such dispute expeditiously, economically and confidentially. The decision of the arbitrator pursuant to the foregoing provisions shall be final and binding. The foregoing arbitration provisions shall continue to be binding on the parties notwithstanding any termination or cancellation of this agreement. Notwithstanding anything to the contrary herein contained, either party shall be entitled to apply for urgent relief in any civil court in respect of any matter arising out of this agreement. Regardless of the place of execution, performance or domicile of the parties, this Agreement shall be governed according to the laws of the Republic of South Africa, and the Parties submit to the authority of any South African court having the requisite jurisdiction over them. No amendment of this Agreement or any consensual cancellation is binding on either party unless confirmed in writing and signed by both parties. Any relaxation or indulgence which either party may show will not in any way prejudice or be deemed to be a waiver of either parties’ right under this Agreement. This Agreement constitutes the whole Agreement between the parties and no warranties or representation, whether expressed or implied, have been given or made by RMM to the Client and vice versa. A It is recorded that you, the undersigned client, have approached RecruitMyMom (Pty) Ltd (“RMM”) to procure consultants for the provision of services to you. B Your relationship with RMM, including, without limitation, the procurement of all / any consultants by RMM for you or any person associated to you will be solely governed by the terms and conditions set out in this agreement (the “Terms of Service”). 1.1. RMM will, upon your request from time to time, put forward one or more of the consultants from its database (the “consultant” or “consultants”, as the case may be) to perform business, related or otherwise agreed services (the “services”), and, upon your selection, will introduce them to you. 1.2. The consultants will provide the services to you directly, as independent contractors. You will appoint each consultant on the terms and conditions in the Consultants Terms set out below. As remuneration for its recommendation and introduction, you will pay to RMM a service fee (the “Service Fee”) calculated as a percentage of the total fee due by you to the consultants in terms of the Consultants Terms (the “Base Fee”). Fees quoted will be inclusive of the Base Fee and the Service Fee, but exclusive of VAT. 3.1.3. any VAT chargeable thereon. 3.2. You will pay the gross fee (being the sum of the amounts referred to in 3.1 above) without deduction or set off and within 7 (seven) days of invoice. Without derogating form the generality of the aforegoing, you may not delay payment of any invoice by reason that any payment due to you relating to the matter is unpaid. 3.3. Where international transfer costs are levied on your payment to RMM, these costs will be for your account. In addition, any fees levied by either your bank or RMM’s bank on cash deposits and/or on cheque deposits will likewise be for your account. 3.4. RMM’s invoicing and collection of amounts due to consultants is for the purpose of convenience to all parties and will in no way detract from 9.1. 4.1. Neither you nor any of your affiliates will use the consultants for the provision of any further work or services without furnishing RMM with advance notification thereof. 4.2. Any further work or services undertaken by the consultants for you will be governed by the Consultants Terms and these Terms of Service. In the event of a conflict between the two, the Consultants Terms will take precedence to the extent of the conflict only. 5.1. Should you appoint a consultant as an employee or to a like position within your organisation, or within an affiliate, or within that of any person associated to you, you will be liable to pay RMM a placement fee reckoned at 20% (twenty percent) of the consultant’s gross annual remuneration as at the date of such appointment, which placement fee shall be payable within 10 (ten) working days of his/her appointment by you. No termination of that appointment or variation of its terms will entitle you to any repayment of the placement fee. 5.2. This clause will survive the termination of this agreement (whether in terms of 6 below or by cancellation for breach), and will apply for 12 (twelve) months after its termination. 6.1. RMM employees are not for hire by RMM’s clients. 6.2. Should an RMM employee leave the employ of RMM and be employed or appointed as a consutant by you or an affiliate of yours within 1 (one) year of having left the employ of RMM, you shall be liable to RMM for a placement fee reckoned at 20% (twenty percent) of that individual’s gross annual remuneration as at the date of such appointment, which placement fee shall be payable, which placement fee shall be payable within 10 (ten) working days of his/her appointment by you. No termination of that appointment or variation of its terms will entitle you to any repayment of the placement fee. 6.3. You agree, and you shall procure that each of your employees, consultants and affiliates agrees, that it shall at no time approach any RMM employees and/or consultants, whether directly or indirectly, with a view to employing them, or with a view to gaining any information about RMM finances, methods of payment, working practices or any company information whatsoever. 7.1. In order to safeguard the confidentiality of consultants, extensive enquiries are not, as a general rule, made to the present or previous employers of consultants at interview stage, unless consultants have specifically authorized RMM to do so. It is customary for background checks to be undertaken only at the stage when, subject to satisfactory reference checks, the consultants will receive an offer of consulting work. 7.2. Background checks, if authorized by an RMM consultant, will only be done on your written request, and may include a credit bureau check, a criminal conviction check and any other reasonable relevant reference check as may be required by you. The costs associated with performing such checks may be charged for separately. 8.1. Subject to 12.4 below, either party may terminate this agreement on 30 (thirty) days written notice to the other party. 8.2. If you terminate a consultancy relationship under the Consultants Terms, RMM will have 10 (ten) working days from the date of such written termination within which to recommend a replacement consultant to complete the services, which recommendation you are free to accept or reject. 8.3. If a consultancy relationship is terminated for any reason, this agreement does not, for the avoidance of doubt, terminate automatically and will remain of full force and effect until terminated by either party in terms hereof. 9.1.7. any recommendations made in good faith by RMM’s employees and/or consultants. 9.2. You hereby indemnify RMM and hold it harmless in respect of any claims brought against it or a consultant, employee or officer of RMM, by a third party for loss, damage, liability, costs and / or expenses of whatsoever nature incurred as a consequence of or arising from or attributable to the services or otherwise in the implementation of this agreement. 9.3. If, notwithstanding 9.1 and 9.2, a court of competent jurisdiction finds that RMM or its employees, officers or agents are liable to you, such liability will be limited to the amount of Service Fees actually paid by you to RMM for those Services in respect of which the liability arose. 10.1. For the purposes of 10 and 12.1, any reference to “information” will mean “personal information” as defined in the Protection of Personal Information Act (Act No. 4 of 2013), regardless of form, insofar as such information relates to you, your business or affairs, employees, directors, clients, suppliers and / or third parties. 10.2. RMM will require information from you from time to time to provide you with the services you require and you undertake, subject to 10.4, to provide or arrange access to such information for RMM as and when RMM determines necessary. This information will only be used by RMM for invoicing and other administrative purposes (where such information relates to your contact details and invoicing information); for the purposes of identifying consultants for possible selection by you and enabling consultants selected by you to provide the services you require; and / or for the purposes of conducting its business and commercial activities. 10.3. Unless otherwise agreed between you and RMM and subject to these terms, RMM will treat information provided by you in terms of this clause 10 as confidential. 10.4. You warrant that you will at all times have the necessary authority, permissions and / or licences to provide information in terms of 10.2, including but not limited to authority, permissions and / or licences to provide information relating to third parties. 10.5. RMM will use the information provided by you in terms of 10.2 for the purposes set out therein and retain such information in whatever form until such time that you request in writing the destruction or deletion thereof. 10.6. RMM will use your contact details to provide you with quarterly newsletters outlining the services it and its consultants provide and any developments that may be of interest, until such time as you advise it otherwise in writing or unsubscribe from its mailing list. 10.7. All title, copyright and any other intellectual property in any documents of whatsoever nature generated or amended by RMM as a result of the provision by it of the services will only pass to you upon receipt by the consultants and / or RMM (as the case may be) of payment of all fees and disbursements which may be owed or owing, in full, without set-off or derogation, in accordance with these Terms of Service. 10.8.2. transferred to or between various countries internationally as a consequence of RMM using information technology hosted or operated by a third party in or from such countries to store and/or process any information in its possession or under its control, which countries may not have data protection laws that are equivalent to those in force in the jurisdiction in which you reside. RMM will, as far as reasonably practicable in the circumstances, use information technology hosted or operated by a third party in or from countries whose data protection laws are equivalent to those in force in the jurisdiction in which you reside. 10.9. This clause 10 will survive the termination or cancellation of these Terms of Service for any reason whatsoever. 11.1. The parties shall use all reasonable efforts to resolve any dispute that may arise under these Terms of Service through good faith negotiations. Each party shall nominate a senior representative of its management to meet at any mutually agreed location to resolve the dispute. In the event that negotiations do not result in a mutually acceptable resolution, the dispute shall be handled in accordance with the remaining provisions of this clause 11. 11.2. In the event of any dispute failing to be resolved through negotiation as per clause 11.1 above, the said dispute or difference shall be submitted to arbitration in accordance with the provisions set out below. 11.3. Such arbitration shall be held at Cape Town and in a summary manner on the basis that it shall not be necessary to observe or carry out the strict rules of evidence or the strict formalities or procedures prescribed under the arbitration laws so that there shall be no written pleadings or evidence or formal discovery of documents, except insofar as required by the arbitrator but otherwise the arbitration shall be conducted according to the procedures prescribed by the arbitration laws of the Republic of South Africa. 11.4. Such arbitration shall be held as soon as practicably possible and with a view to it being completed within 21 (twenty one) business days after it is demanded, having regard to any urgency with respect to the matter in issue. 11.5. The arbitrator shall decide the matter submitted to him according to what he considers just and equitable in the circumstances and shall have regard to the desire of the parties to dispose of such dispute expeditiously, economically and confidentially. 11.6. The decision of the arbitrator pursuant to the foregoing provisions shall be final and binding. 11.7. The foregoing arbitration provisions shall continue to be binding on the parties notwithstanding any termination or cancellation of this agreement. 11.8. Notwithstanding anything to the contrary herein contained, either party shall be entitled to apply for urgent relief in any civil court in respect of any matter arising out of this agreement. 12.1. Client Listing You consent to RMM listing you as a client on its website, which listing may include your company name and logo and / or a testimonial provided by you in respect of the services. RMM will change or remove the listing upon receipt of a written request from you to this effect. 12.2. Severance If any provision of these Terms of Service, which is not material to its efficacy as a whole, is rendered void, illegal or unenforceable in any respect under any law, the validity, legality and enforceability of the remaining provisions will not in any way be affected or impaired thereby. 12.3. Entire agreement These Terms of Service constitute the entire agreement between the parties in regard to its subject matter. Neither of the parties will have any claim or right of action arising from any undertaking, representation or warranty not included in these Terms of Service. 12.4. Variations No agreement to vary, add to or cancel these Terms of Service will be of any force or effect unless agreed to in writing by or on behalf of both parties. 12.5. Survival of Rights, Duties and Obligations Termination of these Terms of Service for any cause will not release either party from any liability which at the time of termination has already accrued to the other party, whether in accordance with these Terms of Service or the related Consultants Terms, or which thereafter may accrue in respect of any act or omission prior to such termination. The parties agree that this agreement will be electronically accepted as binding by you when you check the “I accept the RMM Terms” box, during the job specification loading process on the website. RMM will keep an electronic record of your having checked the box in question, and both you and RMM agree that such record shall be the same as your handwritten signature for the purposes of validity, enforceability and admissibility. On your, the undersigned client’s, request from time to time, RecruitMyMom (Pty) Ltd (“RMM”) will introduce you to consultant/s from its database (“consultants”), who will provide services (“the services”) to you as independent contractors in accordance with these terms (the “Consultants Terms”) (which will govern all and any services provided to you or any person associated to you by any consultant). 1.1 On each request, RMM will put forward one or more consultants to perform the services. On your selection and approval of a consultant, these Consultants Terms will apply to your relationship with such consultants. 1.2 No employment relationship will come into existence between you and the consultants, and they will act as independent contractors to you. The Basic Conditions of Employment Act No. 75 of 1997 (“the BCEA”), the Labour Relations Act No. 66 of 1995, as amended (“the LRA”) and all other Acts of Parliament and / or Regulations that regulate the relationship between employers and their employees, will not be applicable to and will have no bearing upon the relationship between you or the consequences thereof. 1.3 The consultants will be responsible for their own income tax and other related taxes with respect to all compensation payable in terms of these Consultants Terms and they will not be entitled, or eligible to participate in any benefits or privileges provided by you to your employees. 2.6.2 the administration of their own business affairs. 3.5 make payment in accordance with 4 below. 3.6 You will not procure the provision of any services from the consultants other than in accordance with these Consultants Terms and will inform RMM in advance of your intention to procure any further services. Any such further services will be governed by these Consultants Terms, whether or not you have complied with the said obligation to inform RMM thereof. 4.1 For the duration of these Consultants Terms, the consultants will keep accurate records of the services rendered, including time spent and disbursements incurred in doing so. 4.2 The consultants will charge fees, comprised either of an hourly rate (which is increased on each anniversary of the date upon which the consultant first provided services to you, or earlier if so agreed with you), multiplied by the number of hours spent by them on the work or a fixed project or secondment fee agreed with you (as the case may be). 4.3.4 any VAT chargeable on any of the aforegoing. 4.4 While RMM will issue a single monthly invoice encompassing the amounts referred to in 4.3, it should be understood that its invoice in relation to the amounts referred to in 4.3.1 and 4.3.2 will be issued by RMM for and on behalf of the consultants concerned. 4.5 You will pay the gross fee (being the sum of the amounts referred to in 4.3 above) without deduction or set off and within 7 (seven) days of invoice. Without derogating form the generality of the aforegoing, you may not delay payment of any invoice by reason that any payment due to you relating to the matter is unpaid. 4.6 Any regular payment of such monies, whether by EFT, cheque or via payroll, will not constitute a monthly salary in respect of the consultants, nor create any expectation or perceptions of being such. 4.7 Apart from the amounts referred to in 4.3, the consultants will not be entitled to receive any further monies or any benefits of whatsoever nature from you arising from the services in accordance with these Consultants Terms. 4.8 The non-timeous completion of work will not excuse you from payment of invoices in terms of 4.3 above. Should either party commit a breach of any provision of these Consultants Terms and fail to remedy such breach within 7 (seven) days of receiving written notice from the other party requiring it to do so, then the party aggrieved by such breach will be entitled, without prejudice to its other rights at law, or in terms of 6 below, to claim specific performance and / or damages. 6.1 Either party may, in its sole discretion, terminate the services, on no less than 10 (ten) working days’ written notice to the other party. 6.2 Subject to 12.6 below, termination by notice in accordance herewith will not create any rights of renewal or consideration for any periods not completed, or any related obligations. 7.1 The consultants acknowledge that your resources, including servers, computers, work stations, monitors, printers, telefax machines, telephones, postal services, e-mail facilities and internet facilities (“the resources”) are for conducting your business. 7.2 The consultants will have no expectation of privacy in relation to the use of the resources provided by you. 7.3 The consultants understand and accept that you may, at your discretion, monitor their use of the resources and intercept, acquire, read, view, inspect, record and / or review any and all communications created, stored, transmitted, spoken, sent, received or communicated by the consultant on, over or in the resources or otherwise. The consultants hereby expressly consent to you doing so. 8.1 For the purposes of 8, any reference to “information” will mean “personal information” as defined in the Protection of Personal Information Act (Act No. 4 of 2013), regardless of form, insofar as such information relates to you, your business or affairs, employees, directors, clients, suppliers and / or third parties. 8.2 The consultants will require information from you from time to time to provide you with the services you require and you undertake, subject to 8.4, to provide or arrange access to such information for the consultants as and when necessary. You accept that this information will only be used by the consultants to enable them to provide the services that you require. 8.3 Unless otherwise agreed between you and the consultants in writing and subject to these Consultants Terms, the consultants will treat information provided by you in terms of this clause 8 as confidential. 8.4 You warrant that you will at all times have the necessary authority, permissions, and / or licences to provide information in terms of 8.2, including but not limited to authority, permissions and / or licences to provide information relating to third parties. 8.5 You undertake to notify the consultants in writing of any information provided by you in terms of 8.2 that is inaccurate, irrelevant, excessive, out of date, incomplete, misleading or obtained unlawfully and that needs to be corrected or deleted (“defective information”). Upon receiving such written notification, the consultants will correct or delete the defective information and, if necessary, inform RMM accordingly. You accept that the consultants cannot be held responsible for using defective information where they are not aware of the nature and extent of the defects in such information. 8.6 You consent to the consultants using the information provided by you in terms of 8.2 for the purposes set out therein and retaining such information until such time that you request in writing the destruction or deletion thereof. 8.7 All title, copyright and any other intellectual property in any documents of whatsoever nature generated or amended by the consultants as a result of the provision by them of the services will only pass to you upon receipt by the consultants and / or RMM (as the case may be) of payment of all fees and disbursements which may be owed or owing, in full, without set-off or derogation, in accordance with these Consultants Terms. 8.8.2 transferred to or between various countries internationally as a consequence of them using information technology hosted or operated by a third party in or from such countries to store and/or process any information in their possession or under their control, which countries may not have data protection laws that are equivalent to those in force in the jurisdiction in which you reside. RMM shall, as far as reasonably practicable in the circumstances, use information technology hosted or operated by a third party in or from countries whose data protection laws are equivalent to those in force in the jurisdiction in which you reside. 8.9 This clause 8 will survive the termination or cancellation of these Consultants Terms for any reason whatsoever. will be limited to the amount of Base Fees actually paid by you to RMM for those Services in respect of which the liability arose. 9.2 You hereby indemnify the consultants and hold them harmless in respect of any claims brought against them, RMM or an employee or officer of RMM, by a third party for loss, damage, liability, costs and / or expenses of whatsoever nature incurred as a consequence of or arising from or attributable to the services or any other work performed by a consultant, employee, officer or agent for you, your employees, officers or agents. Neither party may assign any of its rights or obligations contained in these Consultants Terms to any third party. 11.1 The parties shall use all reasonable efforts to resolve any dispute that may arise under these Consultants Terms through good faith negotiations. You (the client) shall nominate a senior representative of your management to meet the consultant at any mutually agreed location to resolve the dispute. In the event that negotiations do not result in a mutually acceptable resolution, the dispute shall be handled in accordance with the remaining provisions of this clause 11. 11.2 In the event of any dispute failing to be resolved through negotiation as per clause 11.1 above, the said dispute or difference shall be submitted to arbitration in accordance with the provisions set out below. 11.3 Such arbitration shall be held at Cape Town and in a summary manner on the basis that it shall not be necessary to observe or carry out the strict rules of evidence or the strict formalities or procedures prescribed under the arbitration laws so that there shall be no written pleadings or evidence or formal discovery of documents, except insofar as required by the arbitrator but otherwise the arbitration shall be conducted according to the procedures prescribed by the arbitration laws of the Republic of South Africa. 11.4 Such arbitration shall be held as soon as practicably possible and with a view to it being completed within 21 (twenty one) business days after it is demanded, having regard to any urgency with respect to the matter in issue. 11.5 The arbitrator shall decide the matter submitted to him according to what he considers just and equitable in the circumstances and shall have regard to the desire of the parties to dispose of such dispute expeditiously, economically and confidentially. 11.6 The decision of the arbitrator pursuant to the foregoing provisions shall be final and binding. 11.7 The foregoing arbitration provisions shall continue to be binding on the parties notwithstanding any termination or cancellation of this agreement. 11.8 Notwithstanding anything to the contrary herein contained, either party shall be entitled to apply for urgent relief in any civil court in respect of any matter arising out of this agreement. 12.1 Remedies Unless the contrary is stated herein, no remedy conferred by these Consultants Terms is intended to be exclusive of any other remedy which is otherwise available at law, by statute or otherwise. Each remedy will be cumulative and in addition to every other remedy given hereunder or now or hereafter existing at law, by statute or otherwise. The election of any one or more remedy by any of the parties will not constitute a waiver by such party of the right to pursue any other remedy. 12.2 Severance If any provision of these Consultants Terms which is not material to its efficacy as a whole, is rendered void, illegal or unenforceable in any respect under any law, the validity, legality and enforceability of the remaining provisions will not in any way be affected or impaired thereby. 12.3 Entire Agreement These Consultants Terms constitute the entire agreement between the parties in regard to its subject matter. Neither of the parties will have any claim or right of action arising from any undertaking, representation or warranty not included in these Consultants Terms. 12.4 Variations No agreement to vary, add to or cancel these Consultants Terms will be of any force or effect unless agreed to in writing by or on behalf of the parties. 12.5 General Co-operation The parties will co operate with each other and execute and deliver to the other party such other instruments and documents and take such other actions as may be reasonably requested from time to time in order to carry out, evidence and confirm their rights and the intended purpose of these Consultants Terms. Termination of these Consultants Terms for any cause will not release either party from any liability which at the time of termination has already accrued to the other party or which thereafter may accrue in respect of any act or omission prior to such termination. A It is recorded that you have applied to be appointed as a consultant on the RecruitMyMom (Pty) Ltd (“RMM”) website, on the terms and conditions set out in this document. B These terms are effective from the date on which RMM notifies you (“Consultant”), in writing (which may be via e-mail), that you have successfully registered as a job-seeker on the RMM website. 1.8. not provide your personal information to third parties except as otherwise provided for in these terms. 3.24. acknowledge that you are not an employee of RMM, and are not entitled to any rights and/or benefits bestowed upon employees by law. 4.2. all information owned exclusively by a Client of RMM relating to that Client’s business and which is disclosed to you by the Client in furtherance of any engagement with you in accordance with the RMM Terms, as the case may be, and shall include, without limitation, information relating to the contact information of Clients, instructions received from Clients or the like, its business strategy, operations and performance, technical know-how and data, methods, databases, supplier information, technology infrastructure, processes and procedures, and finances. 5. You acknowledge that, in the course of your relationship with RMM, you may become privy to its confidential information. In this regard you will treat all of RMM’s confidential information as strictly secret and confidential, even after the termination of these terms, and, if requested by RMM at any time, return to RMM and / or delete or destroy any confidential information contemplated by this clause. 6. You are expected to use devices (including PC’s, laptops, tablets and smartphones) of your choosing to carry out work for Clients. You are solely responsible for all costs associated with your device(s). RMM shall not be liable for any damage to your device(s) or loss of any personal or other data from your device(s). “personal information” shall mean personal information as defined in the Protection of Personal Information Act (Act No. 4 of 2013); and “processing” shall mean processing as defined in the Protection of Personal Information Act (Act No. 4 of 2013), and “process” shall have a corresponding meaning. 7.1.5. give effect to the RMM Terms. 7.2. You acknowledge that the personal information contemplated by 7.1 above is reasonably required by RMM to give effect to the purposes set out in 7.1, and you undertake to provide RMM with any further personal information where such information is reasonably required by RMM to give effect to the purposes set out in 7.1. 7.3. You voluntarily consent to RMM processing the personal information that is provided to it pursuant to these terms in order to give effect to the purposes set out in 7.1 and warrant that RMM shall be entitled to process such personal information without seeking any further permissions or consents from you and / or any relevant third parties. 7.4. You accept that all personal information referred to in 7.1 includes but is not limited to personal information submitted by you via the website upon application to be appointed as a Consultant, and any information provided to RMM by you in any other form from time to time. 7.5. You undertake to notify RMM in writing of any information provided by you that is inaccurate, irrelevant, excessive, out of date, incomplete, misleading or obtained unlawfully and that needs to be corrected or deleted (“defective information”) so that such information may be corrected or deleted accordingly, and you accept that RMM cannot be held responsible for the consequences of processing defective information where it is not aware of the nature and extent of the defects in such information. 7.6. You accept that RMM may disclose information about you to any of its employees, consultants, Clients, prospective Clients, officers, agents, suppliers, service providers or subcontractors insofar as this is reasonably necessary for the purposes set out in 7.1 above. 7.7.6. to provide you with job notifications and newsletters outlining general new jobs and any developments that may be of interest, until such time as you advise RMM otherwise in writing or unsubscribe from its mailing list. 7.8.2. transferred to or between various countries internationally as a consequence of RMM using information technology hosted or operated by third parties in or from such countries to store and / or process any information in its possession or under its control, which countries may not have data protection laws that are equivalent to those in force in the Republic of South Africa. 7.9.2. RMM cannot prevent the use or misuse of such information by others. 8. If you are approached with an offer of engagement or professional instruction from a third party that you believe could give rise to a conflict of interest (whether perceived or real) between you and RMM, or between you and a Client, or because the business of the said third party is similar to or competes with RMM, you are requested to notify RMM for the purpose of allowing it to consult with you to determine whether the said engagement or instruction could give rise to any such conflict, and if so, how best to proceed. 9.1. The parties shall use all reasonable efforts to resolve any dispute that may arise under these Consultants Terms through good faith negotiations. RMM shall nominate a senior representative of its management to meet with you (the Consultant) at any mutually agreed location to resolve the dispute. In the event that negotiations do not result in a mutually acceptable resolution, the dispute shall be handled in accordance with the remaining provisions of this clause 9. 9.2. In the event of any dispute failing to be resolved through negotiation as per clause 9.1 above, the said dispute or difference shall be submitted to arbitration in accordance with the provisions set out below. 9.3. Such arbitration shall be held at Cape Town and in a summary manner on the basis that it shall not be necessary to observe or carry out the strict rules of evidence or the strict formalities or procedures prescribed under the arbitration laws so that there shall be no written pleadings or evidence or formal discovery of documents, except insofar as required by the arbitrator but otherwise the arbitration shall be conducted according to the procedures prescribed by the arbitration laws of the Republic of South Africa. 9.4. Such arbitration shall be held as soon as practicably possible and with a view to it being completed within 21 (twenty one) business days after it is demanded, having regard to any urgency with respect to the matter in issue. 9.5. The arbitrator shall decide the matter submitted to him according to what he considers just and equitable in the circumstances and shall have regard to the desire of the parties to dispose of such dispute expeditiously, economically and confidentially. 9.6. The decision of the arbitrator pursuant to the foregoing provisions shall be final and binding. 9.7. The foregoing arbitration provisions shall continue to be binding on the parties notwithstanding any termination or cancellation of this agreement. 9.8. Notwithstanding anything to the contrary herein contained, either party shall be entitled to apply for urgent relief in any civil court in respect of any matter arising out of this agreement. 10.1. You may not subcontract or assign the obligations under these terms to any third party without the prior consent of RMM. 10.2. Either RMM or you may terminate these terms on 10 working days’ written notice to the other. 10.3. RMM does not run credit history checks on its Clients and does not warrant or guarantee that its Clients are able to, or will, pay for services rendered when payment is due, or at all. 10.4. For the purposes of these terms, “Client” means any individual, legal entity or business (including its officers in their personal capacities), or firm which has at any stage been in contact with RMM in connection with the provision of services by RMM and/or its Consultants to such individual, legal entity, business or firm; or any business acquired by it. 10.5. Notwithstanding anything to the contrary which may be contained in these terms, RMM shall not be liable for any direct or indirect (including consequential) loss, damage, costs and / or expenses of any nature whatsoever which you may suffer or incur as a consequence of or which may arise from or be attributable to any acts or omissions on its part. 10.6. You hereby indemnify RMM and hold it harmless in respect of any loss, damage, liability, costs and / or expenses of whatsoever nature which RMM may suffer or incur as a consequence of or arising from or attributable to any acts or omissions on your part, including without limitation any loss, damage, costs and / or expenses of any nature whatsoever suffered or incurred by RMM as a result of any claims brought against the Client, RMM or yourself by any third party. Your liability under this indemnification shall be in addition to your liability to RMM on account of any breach of contract or in delict. 10.7. These terms are standard terms and conditions which apply between RMM and each of its Consultants, and they may, in the sole discretion of RMM, and on reasonable notice to you, be amended from time to time. 10.8. The terms set out in this document (as may be amended from time to time in terms of clause 10.7 above or 10.9 below) constitute the entire agreement between the parties hereto in regard to its subject matter. Neither party shall have any claim or right of action arising from any undertaking, representation or warranty not included in these terms. 10.9. Save for any amendments made by RMM in terms of 10.7 above, no agreement to vary, add to or cancel these terms shall be of any force or effect unless recorded in writing and agreed by or on behalf of both of RMM and the Consultant. 10.10. These terms shall be governed by the laws of the Republic of South Africa. 10.11. The parties agree that the agreement contained in these terms will be electronically accepted as binding by you when you check the “I accept the Consultants Terms” box, during the registration process on the website. RMM will keep an electronic record of your having checked the box in question, and both you and RMM agree that such record shall be the same as your handwritten signature for the purposes of validity, enforceability and admissibility. RMM may revise this document at any time by updating this page. Any use of this Website will be considered acceptance by you of the then-current Terms and Conditions. RecruitMyMom.co.za may change the Website at any time. Questions concerning the use of the Website should be directed to us using the “Contact Us” page.